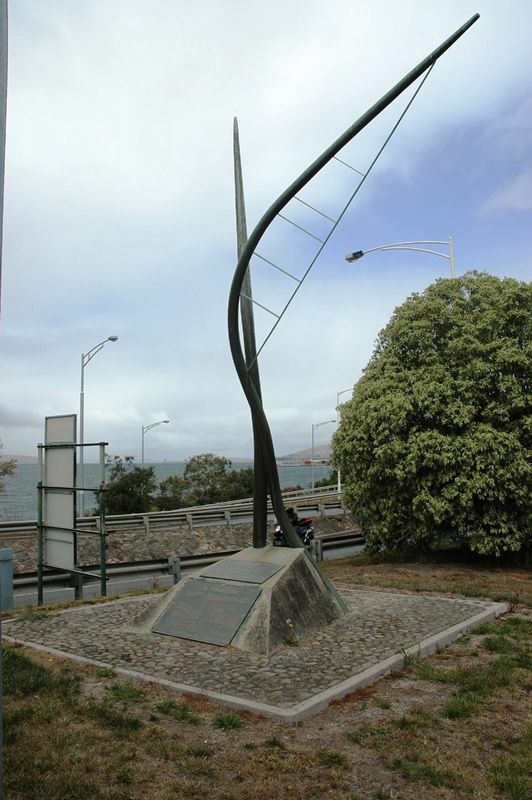 A sculpture commemorates the opening of the Tasman Bridge in March 1965. 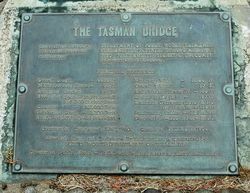 Construction Authority : Department of Public Works, Tasmania. Consulting Engineers : G. Maunsell & Partners (London & Melbourne). Contractor : Reed, Braithwaite, Stuart & Lipscombe, Salisbury, United Kingdom. Overall Length - 4.650 ft.
Width between kerbs - 44 ft.
Navigation span - 310 ft. overall and 240 ft. clear span. Reinforcing steel - 5,200 tons. Number of 54"dia. bored piles - 216. Waterway width - 3,500 ft.
Main viaduct spans [ 19 ] - 140 ft.
Anchor Spans [ 2 ] - 197 ft. Minimum clearance above M.S.L. for shipping - 150 ft.
Prestressing cables - 72½ miles. Deepest pile - 265 ft. below M.S.L. 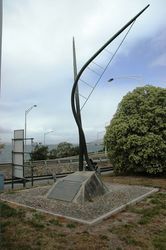 Approach roads and Lindisfarne Traffic Interchange constructed by Public Works Department of Tasmania. Director of Public Works - R. G. Sharp, Esq., B.E., A.M.I.C.E., A.M.I.E. Aust, M.A.P.I.